Volunteer Ministers in Rockport, Texas, stand with a local they have helped (center) after Hurricane Harvey destroyed her home. The last 12 months kept our global VM network busy responding to everything from bombings to hurricanes. Here is a snapshot. On August 25, 2017, 130-mile-per-hour winds and pouring rains wreaked havoc on southeastern Texas—dumping more than 40 inches of rain within a four-day period. Texas emerged drenched and disoriented, with 30,000 forced to evacuate and 17,000 in need of rescue. Within hours of Harvey’s arrival, VMs from across America responded. 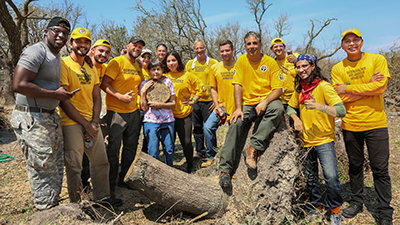 The Austin Church of Scientology served as a central coordinating site from which to dispatch supplies and volunteers on diverse tasks—from distribution of bed linens to cleaning homes—and VMs throughout affected areas delivered assists to victims and first responders alike. They also helped organize a 1,500-mile convoy, delivering 200 tons of donated building supplies to rebuild homes in the hardest-hit areas of Texas. In a region where rain is rare, Burundi was drenched by a torrential downpour, causing widespread flooding and landslides. In a two-day relief mission, Volunteer Ministers helped 800 people, distributing donated supplies to those affected. In the wake of the devastating suicide bombing of the Shrine of Lal Shahbaz Qalandar in Sehwan, Pakistan, leaving 72 dead and more than 250 injured, a team of 10 Volunteer Ministers delivered more than 1,600 assists and trained 154 doctors, nurses and others in VM tools. As word spread of an imminent hurricane—the first to hit Clearwater since 1921—Florida’s Volunteer Ministers got ahead of the curve. They filled up 2,000 sandbags to build a sea wall barrier that protected low-lying buildings. In response to a local shortage of plywood, they trucked in hundreds of sheets of plywood from Atlanta and boarded up all downtown businesses. All told, VMs spent more than 70,000 hours before and after Irma doing what they do best: bringing effective help. The day before Irma hit, VMs spread out across Clearwater to deliver supplies to shelters, coordinate with local officials and help those bracing for the hurricane however they could. But Irma’s wrath was inevitable, and it left in its wake downed trees, wrecked roofs, and no power for over a million residents suffering in the sweltering heat. All told, VMs spent more than 70,000 hours before and after Irma doing what they do best: bringing effective help—from clearing debris to giving assists and serving meals. Peru was hit with the worst flooding in three decades, causing mudslides and landslides, displacing 100,000 and injuring thousands. VMs helped clear mud and debris, built makeshift houses and delivered water and medical supplies to those affected, aiding nearly 77,000 Peruvians. To provide lasting help, the VMs opened a new center in Trujillo, Peru, enabling thousands to learn VM solutions and be prepared for whatever may come.